Avenza Maps (iOS & Android) has the largest digital map store anywhere. We sell both our Recreation Maps and Landscape Maps here. Topo Maps+ (iOS & Mac) is a new venue for our Landscape Maps. We met Stephen of Glacier Peak Studios at the IMIA Denver Meetup in June 2018, where he was touting the digital release of National Geographic’s Trails Illustrated series. He and Danny are great to work with and we’re excited to have a new partner in digital maps. Atlas Landscape Maps are our very best maps, our largest scale, and the largest section (blue tabs) of our printed Road & Recreation Atlas series. We offer seamless digital downloads for each western state. Alaska is divided into regions based on scale and projection, but there is a full-state bundle at a discount. Recreation Maps are digital versions of our folded maps, the “map side” of the sheet. 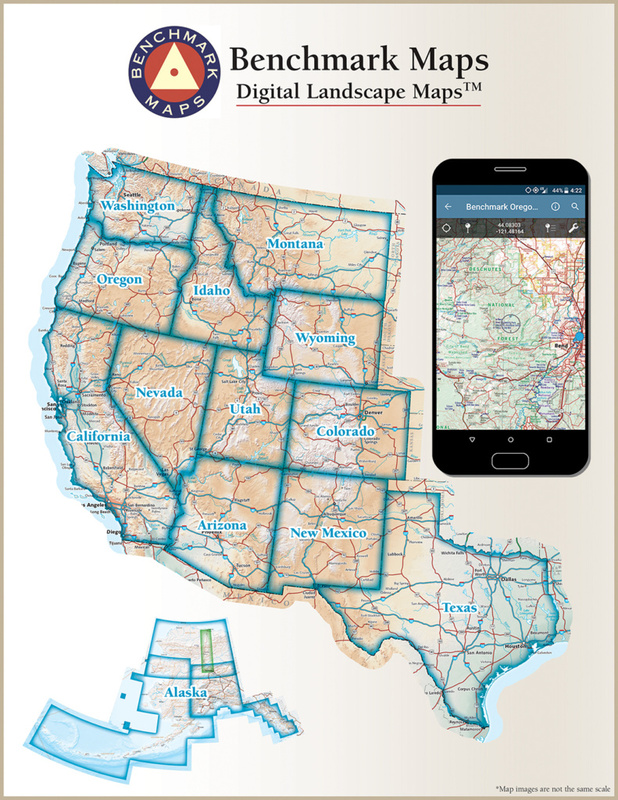 Only available in the Avenza Maps app, they are a great statewide reference map and a low-cost alternative to the highly detailed Landscape Maps, Compared to other state maps, these are rich with content including public lands, county lines, arterial highways, hunting unit boundaries, outdoor recreation POI, point-to-point distances, and more. Includes titles for North Dakota, South Dakota, Black Hills, Nebraska, Kansas, Oklahoma, Eastern Texas, Western Texas, Lake Tahoe, and more.